To be honest, I didn’t know that in the last decades Yevgeny Yevtushenko lived here in the US, in Tulsa, Oklahoma. He died at the age of 84 due to heart failure. Born in 1933 in a tiny Siberian outpost near Irkutsk, he was a descendant of Ukrainian exiles. As a young and good-looking poet Yevtushenko had pop-star status in the Soviet Union during the 1960s. Although not a Communist, he was always careful with his criticism of the Communist Party and the Soviet system. The dissident exile poet Joseph Brodsky said: “he throws stones only in directions that are officially sanctioned and approved.” Brodsky resigned from the American Academy of Arts and Letters when Yevtushenko was made an honorary member. Allen Ginsberg, Yevgeny Yevtushenko and Lawrence Ferlinghetti in San Francisco in the 1960s. Yevtushenko was a literary star in Hungary when I was growing up. 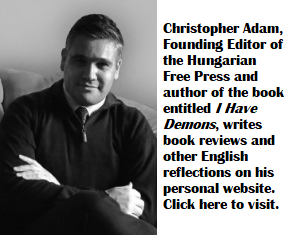 I loved his poems; they were fresh and were translated to Hungarian by great Hungarian literary figures like Gyula Illyés, Dezső Tandori, Zsuzsa Rab, Gábor Garai, István Eörsi and Lajos Áprily. When he visited Budapest several times during the Kádár-era, Yevgeny always received rock-star treatment. 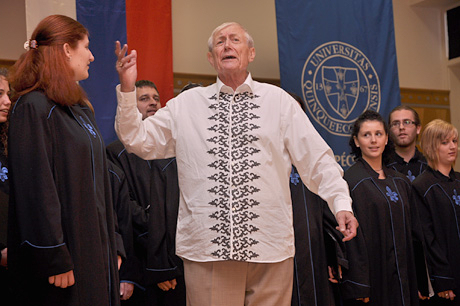 Yevgeny Yevtushenko at the University of Pécs in 2009. It really surprised me that Yevtushenko remained popular in Hungary. In May 2009, just seven years ago, he received his honorary doctorate at the University of Pécs. More than 400 people showed up and the room turned out to be too small. His admirers lined the hallways just to hear him. Yevtushenko was always a bit theatrical, he read his poems in Russian (!) with great gusto and the audience gave him a standing ovation. In the West he is well-known for his epic poem Babij Yar. For me, Yevtushenko was one of the most intriguing literary figures of the 20th century. One Russian thing to admire is their unsurpassed (in volume and level together) poetry, which, unfortunately, only Russian speakers can fully appreciate and enjoy.